Street Justice is a dark drama. 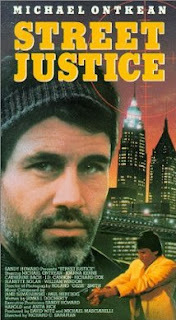 Michael Ontkean stars as Curt, who is a CIA agent. He goes back to his old town to realize it's corrupt. The writing and directing is offbeat for a cop thriller. The acting by Michael Ontkean is very good and Joanna Kerns was tolerable. There's not much action except for the climax. If you looking for another Michael Ontkean movie, Legacy Of Lies (1992) co-starring Martin Landau and Eli Wallach is a fine one. Ontkean is just as underrated as Eric Roberts or Treat Williams.